Green Bay Packers fans have had plenty to cheer about over the years and they know the best way to celebrate is with a Lambeau Leap. Over the course of the franchise’s largely successful 95 years of existence, Green Bay Packers fans have had plenty to cheer — and cheers — about. There’s the 13 titles (nine NFL championships and four Super Bowl victories), which are more than any other team. There’s the legendary coach with the fabled quotes, Vince Lombardi, for whom the Super Bowl trophy is named. There’s the trifecta of exceptional quarterbacks, Bart Starr and Brett Favre and Aaron Rodgers, the last two of whom have provided the franchise more than two decades of sustained winning. There’s the home stadium, Lambeau Field, the oldest venue in the NFL, considered a hallowed ground of triumph on tundra. And there’s the pride and pleasure that comes from Green Bay being the smallest market in American professional sports, yet having arguably (or incontrovertibly, if you asked them) the most loyal and passionate fans in football. Indeed, Packers supporters have had a lot to savor. But it hasn’t always been perfectly grilled tailgate brats and annual division titles for Green Bay fans. 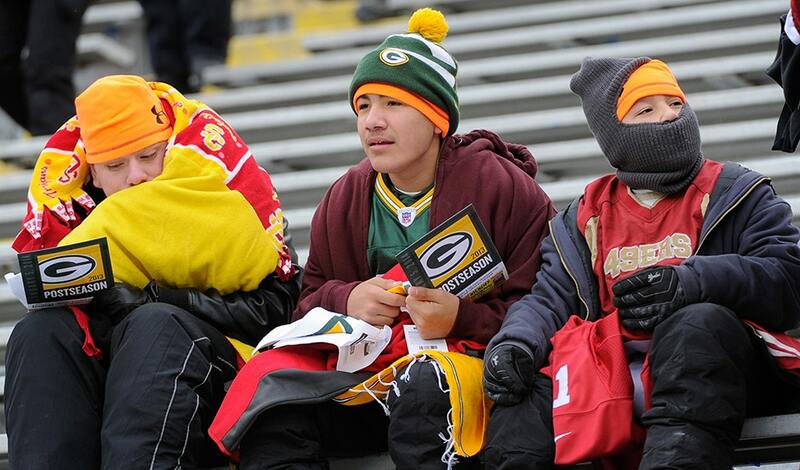 There’s a lot more to being a Packers fan than just Cheeseheads, championships and chilly weather. So without further ado, but with fitting adulation, here are the . . .
Green Bay’s football franchise isn’t named for some generic animal or drab color (sorry, almost every other NFL team, and Cleveland). The name comes from its first sponsor, the Indian Packing Company, which in 1919 gave $500 to employee Curly Lambeau for uniforms and equipment for the football team he’d founded. A year later, Indian was purchased by the Acme Packing Company, which continued to support the team. So the Packers have, since their formation, been a nod to the canned meatpacking industry that helped launch them. Sure beats being named after just another big cat. 2. The Ice Bowl was the original "Miracle on Ice"
In 1967, on New Year’s Eve, Green Bay and Dallas met at Lambeau Field in the NFL Championship Game. It was and still is the coldest game in the history of the league, with a kickoff temperature of 15 degrees below zero and a wind chill of almost 50 below. After Lambeau Field’s turf-heating system malfunctioned and the field tarp was removed before the game, the moisture on the ground froze and created an icy surface that worsened as the day went on and the stadium’s shadows grew. The marching band members’ instruments froze to their lips (so the performance was canceled); the referees’ whistles froze to theirs (so they used only voice commands). Multiple players suffered frostbite. But with 16 seconds remaining in the game and the Cowboys ahead 17-14, the Packers had the ball inside the Dallas 1-yard line on third down. Bart Starr called a timeout and was told by Vince Lombardi, "Run it, and let’s get the hell out of here." Starr called a quarterback sneak and, behind right guard Jerry Kramer (who Packers fans understand belongs in the Hall of Fame), ran in for the game-winning touchdown. Since it was played on a frozen surface 13 years before the 1980 Olympics, and because it was only the semifinals — the winner of the NFL Championship played the winner of the AFL Championship, which was the Oakland Raiders, for Super Bowl II (and the Packers were victorious) — the Ice Bowl comeback was not just one of the greatest football games ever. It was, with all due respect to Team USA Hockey, the original "Miracle on Ice." 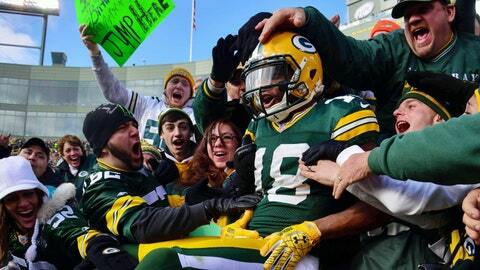 The Lambeau Leap is as cherished a touchdown celebration as there is in football (or, at least, it’s better than the Sharpie). But it wasn’t an offensive player that invented the Leap, even though former Packers wide receiver Robert Brooks popularized it. Safety LeRoy Butler was the first player to jump into the adoring arms of Packers fans in the end-zone stands, doing so after he scored a defensive touchdown in 1993. And even though it wasn’t known as the "Lambeau Leap" until later, the move’s legitimacy was evinced after the NFL grandfathered it into the new rules in 2000 that banned excessive celebrations. Some opposing players have tried to do the Lambeau Leap, but they’re always shoved back. Green Bay fans know only a Packer is allowed to Leap. The only publicly owned, non-profit sports organization in the United States, the Packers have more than 360,000 stockholders that collectively own more than five million shares of stock. The franchise’s original articles of incorporation establish that there can be no financial gain for shareholders. The team has held stock sales a few times in its history, most recently in 2011, where any individual can buy in (in 2011 a share of Packers stock cost $250). While it’s essentially just a piece of paper — Packers stock doesn’t come with the rights and privileges of regular stock and has no economic value — Green Bay fans are proud to frame and display their shareholder certificates in their man caves, living rooms and front hallways. 5. Never mention the name "Tony Mandarich" or the words "fourth-and-26"
In 1989, the Packers had the second overall pick in the draft and they used it on hulking offensive lineman Tony Mandarich. Considered the best offensive-line prospect ever, Mandarich turned out to be one of the biggest draft busts in NFL history. Arrogant, lazy and, it was later revealed, a steroid user, Mandarich was cut after three seasons. 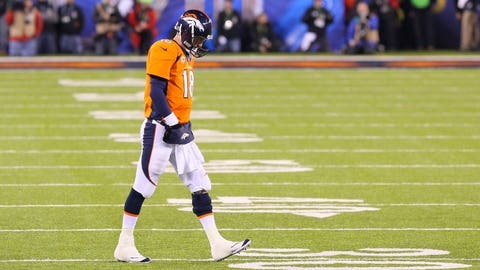 Peyton Manning's had a lot of good -- and bad -- games in the playoffs. We rank the top 10. What makes the pick even worse for Packers fans is that, when Green Bay selected Mandarich No. 2, the team passed on future Hall of Famers Barry Sanders, Derrick Thomas and Deion Sanders, among others. Ouch. Also atop the list of things that will make Cheeseheads stick their fingers in their ears and yell "Lalalala" are the words "fourth-and-26," a reference to the infamous play in 2004 during a divisional playoff game between the Packers and Eagles. 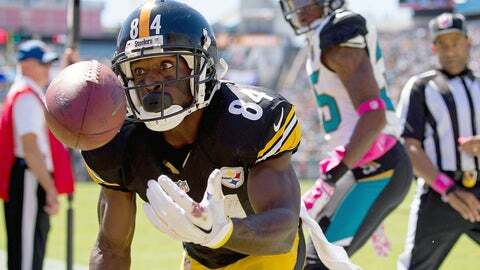 Green Bay led 17-14 late in the fourth quarter when Philadelphia, with no timeouts, faced fourth down and 26 yards to go. Without going into too much painful detail, suffice it to say Eagles quarterback Donovan McNabb completed a pass to receiver Freddie Mitchell — amid abhorrent coverage (looking at you, Darren Sharper) — that was somehow just enough for the first down. Soon after, kicker David Akers converted a field goal that tied the game. In overtime, after (of course) a Brett Favre interception, Akers made another field goal to give Philadelphia the victory. Tony Mandarich and Freddie Mitchell, two first-round busts that both managed to rip out the hearts of Packers fans. Anyone who’s ever been at a Packers home game in winter and gotten out of his/her bleacher seat to get a beverage has had one, the other or both of the standard, horrible, drink-related experiences. You’re ice-cold and want to warm up with a nice hot chocolate, so you buy one, take a sip and — OMG OW! It’s scalding hot and you’ve now singed off much of your tongue and melted most of your mouth. Enjoy those delicious cheese curds with your eradicated taste buds! Or, you’re ice-cold and want to warm up by putting on a "booze blanket," so you go to the beer stand, purchase one, return to your seat and find that — oh, terrific! — your frosty brew is now literally frozen solid. Have fun chipping away at that beercicle for the next 45 minutes! In 1996, the Packers, assembled by general manager Ron Wolf and coached by Mike Holmgren, were a total football juggernaut. Led by quarterback Brett Favre, defensive lineman Reggie White and returner Desmond Howard, Green Bay was No. 1 in the league in offense, defense and special teams. The Packers were the first team since the 1972 Dolphins to lead the NFL in offense and defense in the same season. That squad went 13-3, won its division, cruised through the playoffs and beat the New England Patriots for Green Bay’s first Super Bowl title since the Lombardi era. It was a flex-your-muscles, dominant kind of season. In 2010, the Packers, assembled by general manager Ted Thompson and coached by Mike McCarthy, were a Cinderella story of a team coming together late in the season and going on a magical run. Led by quarterback Aaron Rodgers, cornerback Charles Woodson and aided by several undrafted and street free agents, Green Bay was ninth in the league in offense, fifth in defense and had decent special teams. Despite 16 players on injured reserve, including seven starters, the Packers won the final two games of the regular season to sneak into the postseason as the No. 6 seed. There, they got Lambeau-hot-chocolate hot and proceeded to roll through the NFC playoffs, ultimately defeating the Pittsburgh Steelers in the Super Bowl, with Rodgers being named the game’s MVP. It was an against-all-odds, destined-to-be kind of season. Brett Favre led Green Bay out of its 25-year-long dark age, winning three Most Valuable Player awards, capturing a Super Bowl and leading the Packers with a vigorously entertaining, excitingly unpredictable style that endeared him to fans for two decades. That is, until he retired and unretired, retired and unretired again, went to New York to play for the Jets, and then committed the Packers-fan equivalent of a mortal sin. Favre went full turncoat when he crossed the border to Minnesota and wore the hated purple. Not only did he play for the Vikings, but in 2009 he beat the Packers twice — including in his much-ballyhooed return to Lambeau – and led the Vikings to a 12-4 record and the NFC Championship Game, while going to the Pro Bowl. After Favre left Green Bay on sour terms — varying reports say either Thompson or McCarthy, or both, didn’t want him back in 2008, choosing to go with young Rodgers — there was a schism in Packer Nation. It seemed like half the fan base decried the decision to let the beloved Favre go, while half were tired of his indecision and wanted to see what Rodgers could do. Nearly all, though, considered playing for Minnesota an awful, treacherous, reprehensible betrayal. 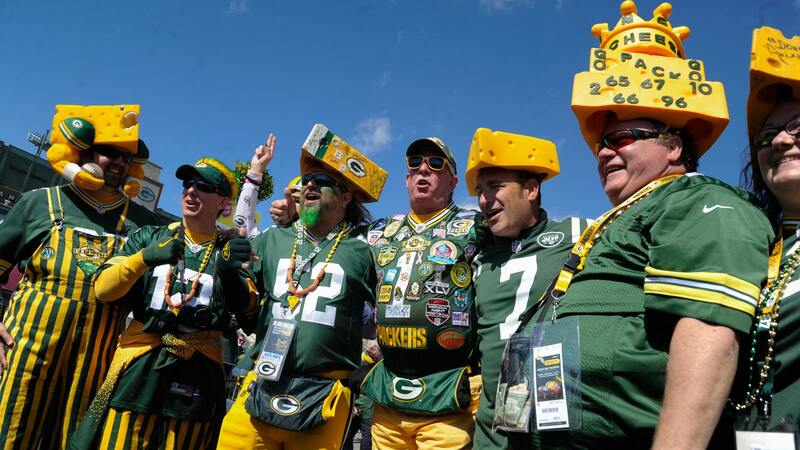 While most of the Lambeau Field faithful are adorned in green and gold, there are certainly plenty that choose to wear something else (or not much at all). Late in the fall, after Wisconsin’s deer hunting season has begun, it’s quite common to see thousands of Packer fans dressed in blaze orange hunting gear. Many of them hunt earlier in the day before the game, while some just like the look. No matter what, they’re assuredly not Bengals fans. Then there’s the cold-unfeeling bikini girls, who have been known to show up to games in just a teensy top and, usually, clever signs. Last season, when Rodgers was out with a broken collarbone, four girls in bikinis held up signs that said: "Rodgers out? You gotta ‘bikini’ me!" It was late November and the temperature was below 20 degrees. And, of course, St. Vince. A diehard fan who wears a green robe and Packers vestments, a bishop’s headdress depicting the smiling face of Vince Lombardi and a papal Cheesehead staff, St. Vince is adored in the stands and often shown on television. Sacrilegious? Not if it’s the Packers you worship. Who's the top dog in NFL this week? Sound off on our weekly rankings. Most of the year, Green Bay is a perfectly nice, low-key Wisconsin city of about 100,000 people that’s off the beaten path and generally lacking in the major goings-on department. But for eight days a year (not counting preseason or playoffs), when the Packers have a home game, it becomes a lively and bustling place to be, a happening hub of commercial activity, media attention and jam-packed-crowd excitement, a land of a hundred front-yard-converted parking lots and a thousand smoky tailgates, of back-and-forth-tossed pigskins, reverberating "Go Pack Go!" chants and green and gold and guts and grins. Because when the home team plays football, Packers fans understand Green Bay is the center of the universe.